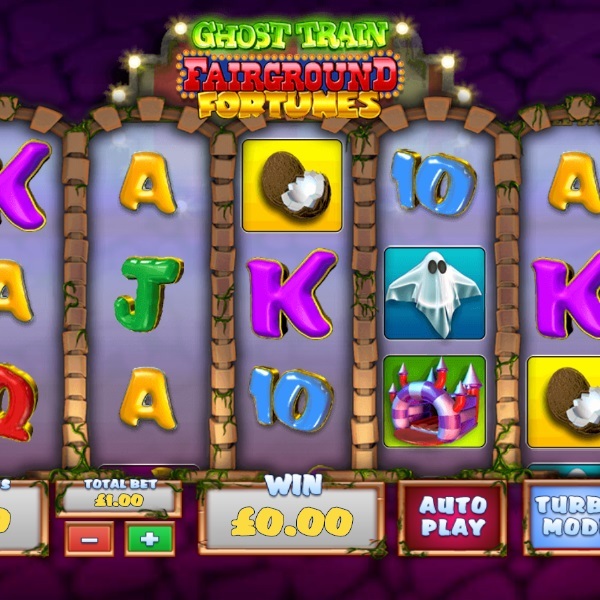 Playtech is inviting you to the fun fair in its new slot release Ghost Train Fairground Fortunes and you can enjoy a number of bonus features. It is a 5 reel slot with 20 fixed paylines. The high value symbols include a dodgem car, a bouncy castle, a ghost and the gameâ€™s logo. The wild symbol is a grinning skull, the scatter is a coconut and there are two bonus symbols, the ghost train and the bat. When the ghost train lands on the middle three reels you get a ride on the train and each monster you encounter awards a cash prize. At the end of each ride you get the option to try and trigger the bonus again by selecting the correct ticket. When the bat lands on reels one, three and five you are given ten free spins on special reels that have fifty paylines and stacked wilds.